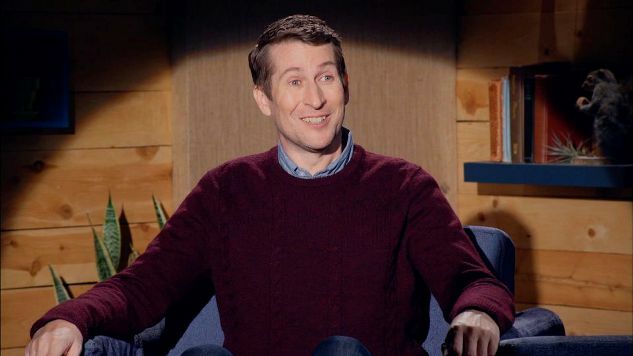 Going Out With a Bang: Saying Goodbye To Comedy Bang! Bang! Comedy Features Comedy Bang! Bang! I will never forget my first experience with Comedy Bang! Bang! In 2010, I was having a rough time. I was working overnight at a job I hated and was just out of a years-long relationship. Nothing made me happy anymore. In an attempt to get out of my daily malaise, I looked through the iTunes Comedy podcasts and decided to download “The Best of 2010” episode of a podcast I had never heard of: Comedy Death Ray. At about two A.M. at the aforementioned job, I listened to host Scott Aukerman and guest Paul F. Tompkins present the best moments from the ending year. I was introduced to Nick Kroll’s Spanish-language DJ El Chupacabra, Tompkins’s over-the-top Andrew Lloyd Webber and Seth Morris’s chronically injured Bob Ducca. And I couldn’t quit laughing. I laughed until I cried and my stomach hurt at a time when I needed to be happy more than anything. What Aukerman gave me and his audience with this and every episode was a consistent source of pure joy. In the world of Comedy Death-Ray—which would become Comedy Bang! Bang!—the weirdest characters could come from the most mundane origins, like a high school student from Marina Del Rey or a little orphan boy, and inspire comedic brilliance. A simple mispronunciation could turn “heynongman” into a catchphrase. The audience of Comedy Bang! Bang! could feel like a select group, one who found it hard to hear “my wife” or “it’s been a while” without laughing to themselves, aware of an inside joke that no one got. Aukerman introduced the world to a universe of comedians and characters, with its own comedic language full of references and odd diversions that could turn mistakes into convoluted canon and the simplest lines or cheesy jokes into transcendent experiences. In that first episode I listened to, Aukerman described his podcast as “part talk show, part comedy program. We don’t talk about comedy. We try to do it.” What started as a live show at the Upright Citizens Brigade Theater in Hollywood would go on to become the podcast, which in 2012, became a TV show on IFC. On the podcast, the audience had to use their imagination for whatever crazy whims the host and his guests felt like exploring. But with Comedy Bang! Bang! the TV show, this insane universe became flesh and blood. It no longer resided in our earbuds and our imaginations—it was now on TV. By becoming a television show, it was almost as if the style of humor that the fans loved was being validated. Going back to the first episode, “Zach Galifianakis Wears A Blue Jacket & Red Socks,” which premiered on June 8, 2012, the format of the podcast translated quite well into the new format. Galifianakis was an ideal guest, and characters from Thomas Lennon and Andy Daly brought familiar voices into the spotlight. Having performed the theme song for the podcast, Reggie Watts was the obvious choice for the show’s bandleader and Aukerman even has his guests play a game at the end of the episode, much like he often does on the podcast. But from that very first episode, Comedy Bang! Bang! substantiates its existence on television, throwing out ideas that could’ve never been done in an audio-only format. At one point, Galifianakis tries to imagine a dog talking, which then turns Aukerman into a talking dog (Aukerman’s actual dog, Rocky). Games like “Tsk Tsk, Attaboy” would’ve never made sense without the visual element, nor would a random plot where Aukerman feeds his parking meter in a post-apocalyptic wasteland. As a podcast, one of Comedy Bang! Bang!’s main strengths was its loose format and improvisation. Yet as a TV show, Bang! Bang! would use its structure as a gift, rather than a curse. In its 110 episodes, Bang! Bang! could reconfigure its show to parody everything from Pixar films to time-travel adventure. The podcast had no limits other than the lack of visuals, but even with the limits the TV show had, like budgets and time restraints, the show still was able to allow any idea to work incredibly well. This adventurous ability to make almost every episode a different style kept the show exciting and fresh, even if taking the easy way out would’ve still been hilarious. Did the show need to have an upside down episode, or tell an entire show in one shot? Probably not, but it created a unexpected quality that was always fascinating. This, of course, couldn’t have been done without Bang! Bang! phenomenal writing staff. Many of the jokes scream of Aukerman’s brand of humor, but equally important is head writer Neil Campbell, the show’s secret MVP. Over the course of its five seasons, Campbell’s writing has provided some of the strangest and hilariously cringey lines on television. For example, a recent episode featured the line “this drink is like Hugh Laurie’s hat: On the House,” a joke so unbelievably cheesy, but also remarkably hysterical. Bang! Bang!’s writing staff was consistently well-staffed with some of the finest writers available. Tim Kalpakis, David Ferguson and Mike Hanford of the comedy troupe The Birthday Boys, Love co-creator Paul Rust and New Girl story editor Joe Wengert all helped Bang! Bang! become one of the best written shows on TV today. When Andy Samberg hosted The 88th Annual Academy Awards, Aukerman and Campbell brought the Bang! Bang! voice as writers to Hollywood’s biggest night. The podcast might’ve been a one-person show, but by giving Aukerman a cohost and bandleader, the show found new life with dual leads. For the first seventy episodes, Reggie Watts became just as much the face of Bang! Bang! as Aukerman. Having been a frequent guest on the podcast, Watts and Aukerman had a natural rhythm and quickly the friendship of these two as characters on the show became quite effective. When Watts left in “Judd Apatow Wears A Polo and Blue Suede Shoes,” it became Bang! Bang!’s first legitimately emotional goodbye, a wonderful sendoff to a great bandleader that had been stolen by that backstabber James Corden. Equally great was Kid Cudi, a relative newcomer to the Bang! Bang! world and an excellent sidekick for Aukerman. The dynamic between Aukerman and Cudi revitalized a show that didn’t even need it, changing the style in slight ways but keeping with the show’s general aesthetic. After twenty episodes, Cudi would leave, his place taken by maybe the most apparent bandleader choice: “Weird” Al Yankovic. Having been a part of Bang! Bang! since the eighth episode of the podcast, Yankovic fit the series like a glove. As one of the only actors to appear in every season, and one of the most frequent guests on the podcast, Aukerman and Yankovic made the show feel like two old friends just hanging out and having fun. It’s that passion and fun that made Comedy Bang! Bang! work so well as a TV show. It almost felt as if Aukerman, Watts, Cudi, Yankovic, Campbell and others were getting away with something. Comedy Bang! Bang! was a Pee-Wee’s Playhouse for comedy nerds, a place where anything and everything can and will happen. With the amazing crew behind and in front of the cameras, it’s easy to imagine Bang! Bang! being able to go on for another 110 episodes, It’s incredible that the show never slipped into monotony, only getting better with age—an unbelievable feat. After 110 half hours, it’s sad that Comedy Bang! Bang! will be ending in its TV format, but it’s wonderful a show like this could even exist in the first place. Bang! Bang! has always been a niche show of weirdos made for the even bigger weirdos that love it. It’s also been a dream come true, a very specific style of humor fully realized and released into the public for the world to enjoy. We still have the podcast and the reruns, but it’s a shame a show full of life and ingenuity will be leaving at the top of its game. Iiiiiiiiiiiiiiiiiit’s been wonderful while it lasted and all joking, a salad, thank you to Comedy Bang! Bang! for bringing such joy to the people and fans that it has meant the world to. Comedy Bang! Bang!’s final episode airs tonight on IFC at 11 PM. Ross Bonaime is a D.C.-based freelance writer and regular contributor to Paste. You can find more of his writing at RossBonaime.com and follow him on Twitter.